The programme was inaugurated by Hon. 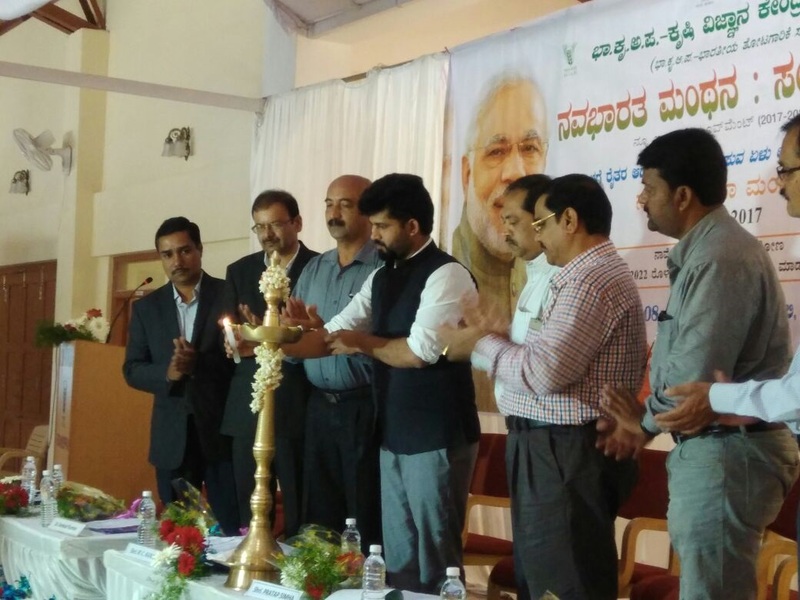 Shri Pratap Simha, MP (Mysore Kodagu Loksabha constituency) by lighting the lamp. Honorable Prime Minister’s video message on various Government schemes for strengthening farmers was shown to the audience. The MP read the pledge on seven points for doubling the farmers income which was repeated by all the farmers and officials. 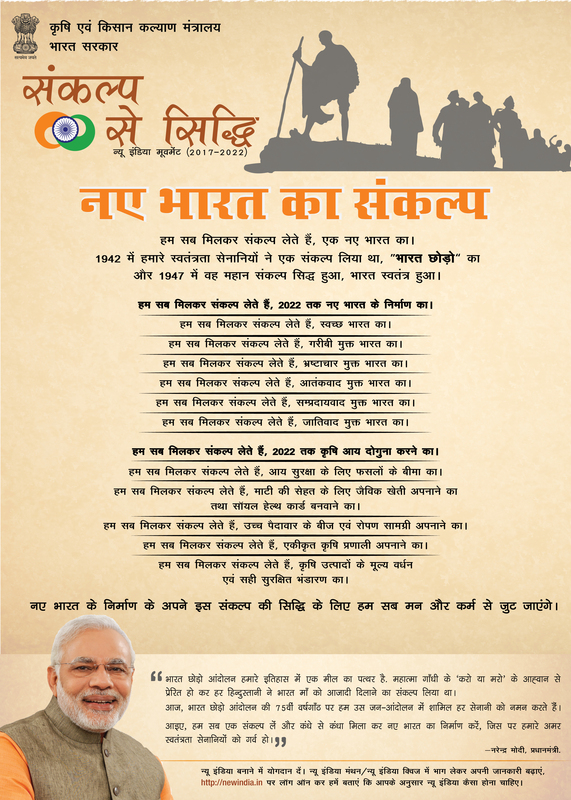 All participants took a pledge towards creating a new India which is strong and prosperous. 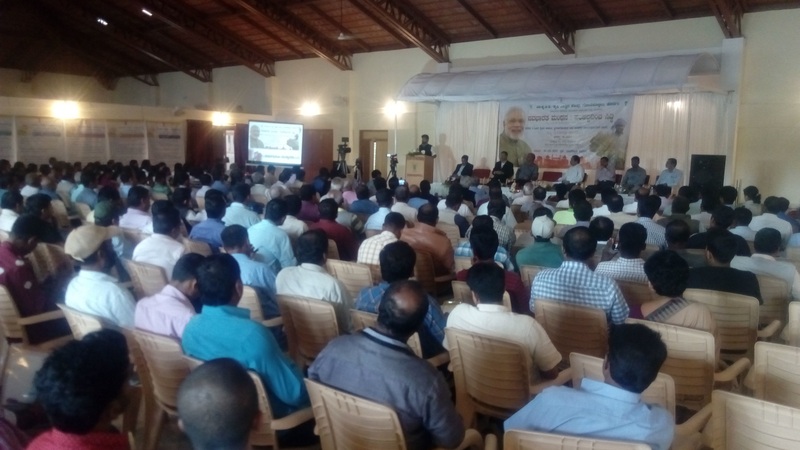 More than 400 farmers from different parts of the district participated in the even. A publication on Sankalp se siddi was released on the occasion by the Hon. MP. Shri Pratap Simha ji in his Chief guest address said that this year we are celebrating the 75thanniversary of Quit India Movement. So the Prime Minister has exhorted all the departments to make strategies for making a New India by 2022 which can make our freedom fighters proud. Chief Guest's Remarks:Shri Pratap Simha ji in his Chief guest address said that this year we are celebrating the 75th anniversary of Quit India Movement. So the Prime Minister has exhorted all the departments to make strategies for making a New India by 2022 which can make our freedom fighters proud. He talked about the various schemes like Pradhan Mantri Krishi Sinchai yojana, Soil Health card scheme, Pradhan Mantri Fasal Bheemá Yojana which the farmers should take benefit of. He exhorted the farmers to go for soil analysis based nutrient application to their coffee, pepper and paddy crop. He exhorted the farmers community to strengthen the prime ministers hand in creating a new India. A folder on Puthari Farmers Producer Company Ltd, which is supported by NABARD and KVK, Gonikoppal was also released during the event.